Unbeelievable Health | 9 Tips to Help Boost your immune system to dodge colds, flu and illness. 25 Jan 9 Top Tips to Strengthen Your Immune system to Help Dodge Colds, Flu and Illness. 31 million working days were lost in 2017 due to coughs, colds & flu. Sickness absences cost the UK economy £15 billion. Not only is it a bore to be ill, but missing work or having to stay home to care for sick children or loved ones can be very inconvenient. Illness can also impede travel & all sorts of plans. Did you know that a few simple lifestyle changes can help you strengthen your immunity to help dodge colds, flu and illness and to put you in good stead for hay fever season (hay fever is worsened by overactive immune response & propolis helps modulate the immune system & has anti-inflammatory actions- STUDY). A healthy immune system is the best insurance to have when it comes to helping avoid feeling unwell so make sure it’s in top working order. A doctor explains here how a well functioning immune system can help ward off colds, flu & illness. Eliminate refined white sugar. It’s been shown to compromise immunity. Use natural sweeteners like honey, Sweet Freedom, stevia or agave. Avoid coffee, excess caffeine can dehydrate the body which can make one more susceptible to colds and flu. Try herbal teas instead. Eat more protein & add more colourful vegetables & fruit to your diet. Carbs spike sugar levels in blood due to their high glycemic index which stresses the immune system and encourages bacteria growth. Protein helps build natural defences against illness. The more richly coloured foods usually have higher levels of vitamins and nutrients. Take immune support supplements daily or at the very first sign of illness. Like a multivitamin, it’s a great supplement to take year round. 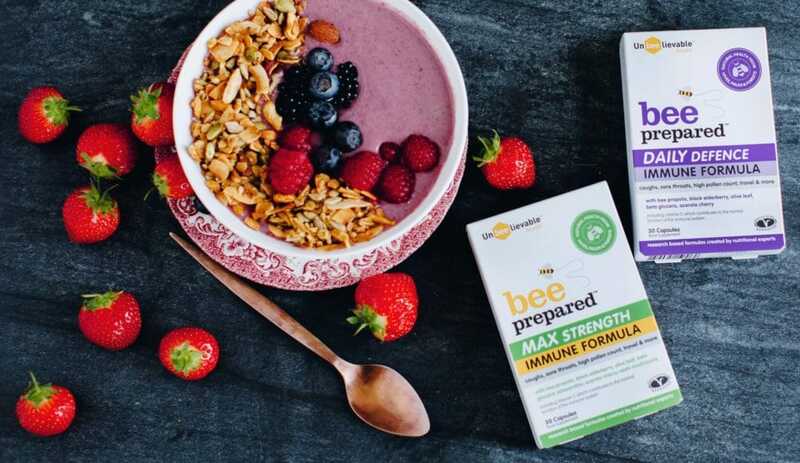 Bee Prepared immune formulas contain natural, plant based ingredients with proven benefits which are not usually found in a regular diet (bee propolis, black elderberry, olive leaf , beta glucans and more) which support, but do not stimulate the immune system (like ecinacea can which is why it shouldn’t be taken long term). Find it in independent health stores & chemists, Boots, Holland & Barrett, organic groceries and online globally via Bodykind. Go easy on over the counter remedies. They often contain the same things like acetaminophen (as in tylenol etc) and an overload can damage the liver. Also read the label- several cough syrups contain chloroform and ingredients that have been shown to be carcinogenic in high amounts. There are lots of better natural remedies out there that do no harm and could provide more than just helping you feel better temporarily like most OTCs do. Honey has been shown in studies to be an effective cough suppressant. Probiotics. Eat foods like natural yogurt or take good quality probiotic supplements- we love Optibac. Exercise. Research has shown that those who exercise regularly have half as many sick days due to colds and flus as moderate exercise strengthens the immune system (see here). Sleep. Lack of quality sleep has been shown to compromise the immune system. A good night’s rest is as important as eating healthily! Chill. High levels of stress and anxiety have been shown to impact the immune system. Meditation, walks in nature, cooking, reading and even spending time with pets have all been shown to lower stress levels. Bee Prepared immune formula is suitable for most ages (Bee Prepared Daily is best for children) and Optibac Probiotics also make a version for children. The capsule contents of both (Optibac also has powdered versions) may be added to juice, smoothies, yogurt & raw recipes. See our Instagram page for recipe inspo- just click here.